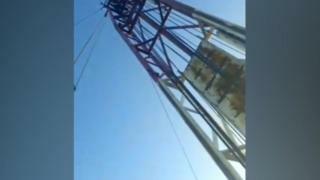 A man has been arrested after three protestors scaled a 60ft high fracking rig in North Yorkshire. Two men and a woman climbed to the top of the site at Kirby Misperton, between Malton and Pickering, at about 03:00 BST, police said. A 29-year old man is in custody on suspicion of aggravated trespass and criminal damage after he climbed down at about 15:45. The other two remain at the site and were issued with safety harnesses.